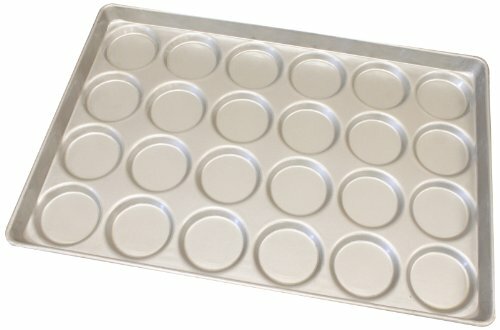 Magna Industries versatile pan can be used to make hamburger buns, rolls, or muffin tops. Constructed of professional weight 22-gauge aluminized steel with seamless construction, it resists corrosion and provides an even heating performance. Arrangement: 4 x 6 cups. Vertical depth is 9/16-inch, top in: 3-5/8 inches, bottom out: 3-3/8 inches. 1/4-inches diameter wire In rim. Overall measures 25-3/4-inches length by 17-3/4-inches width by 1-1/8-inches height.